Filed under Fade to Black; 1 comment. It's proving a rather devastating year for Hollywood's roster. Yesterday, we lost the many talents of dancer and actress Cyd Charisse. In an unexpected synchronicity, it's been in just these past six months that I became familiar with Ms. Charisse's work beyond her non-speaking role in Singin' in the Rain. When I was offered a part in a community theater production of Brigadoon, I quickly consumed the movie version to see what I was getting myself into. Though I now suspect the women's dance numbers did not showcase Ms. Charisse's full range of talent as the female lead, I was enamored of the film's colors and her chemistry with Singin' partner Gene Kelly. A few months later, I finally saw them again reunited in It's Always Fair Weather, a musical I'd seen a clip of a decade past. Though a surprisingly unremarkable film for a performer of his caliber, the scene that drew me to it — a Gene Kelly dance number performed on roller skates — was worth the price of admission, while Ms. Charisse's sassy number in the boxing ring got her the screen time she deserved. Though not all musicals translate well to film, the medium is infinitely capable of grand tales of song and dance. Hats off to Cyd Charisse for cementing the genre's place in Hollywood's history. Van Johnson, who played Jeff Douglass in the movie version of Brigadoon, died today at the age of 92. 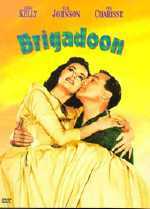 Brigadoon is the only movie I've ever seen Mr. Johnson in. The occasion was earlier this year, when I was cast in his role in the stage musical of the same name. Rarely would people recognize my character's name, but when I told them I was playing the Van Johnson part, their faces lit up. I'm sorry to hear that two of Brigadoon's lights have dimmed in this same year I came to know them.